The skull is square, flat on top, free from wrinkles, cheeks flat, brow abrupt and the stop well defined. The ideal Boston Terrier expression is alert and kind, indicating a high degree of intelligence. This is a most important characteristic of the breed. The eyes are wide apart, large and round and dark in color. The eyes are set square in the skull and the outside corners are on a line with the cheeks as viewed from the front. Disqualify - Eyes blue in color or any trace of blue. The ears are small, carried erect, either natural or cropped to conform to the shape of the head and situated as near to the corners of the skull as possible. The muzzle is short, square, wide and deep and in proportion to the skull. It is free from wrinkles, shorter in length than in width or depth; not exceeding in length approximately one-third of the length of the skull. The muzzle from stop to end of the nose is parallel to the top of the skull. The nose is black and wide, with a well defined line between the nostrils. Disqualify - Dudley nose. The jaw is broad and square with short regular teeth. The bite is even or sufficiently undershot to square the muzzle. The chops are of good depth, but not pendulous, completely covering the teeth when the mouth is closed. Serious Fault - Wry mouth. Head Faults - Eyes showing too much white or haw. Pinched or wide nostrils. Size of ears out of proportion to the size of the head. Serious Head Faults - Any showing of the tongue or teeth when the mouth is closed. The length of neck must display an image of balance to the total dog. It is slightly arched, carrying the head gracefully and setting neatly into the shoulders. The back is just short enough to square the body. The topline is level and the rump curves slightly to the set-on of the tail. The chest is deep with good width, ribs well sprung and carried well back to the loins. The body should appear short. The tail is set on low, short, fine and tapering, straight or screw and must not be carried above the horizontal. (Note: The preferred tail does not exceed in length more than one-quarter the distance from set-on to hock.) Disqualify - Docked tail. Body Faults - Gaily carried tail. Serious Body Faults - Roach back, sway back, slab-sided. 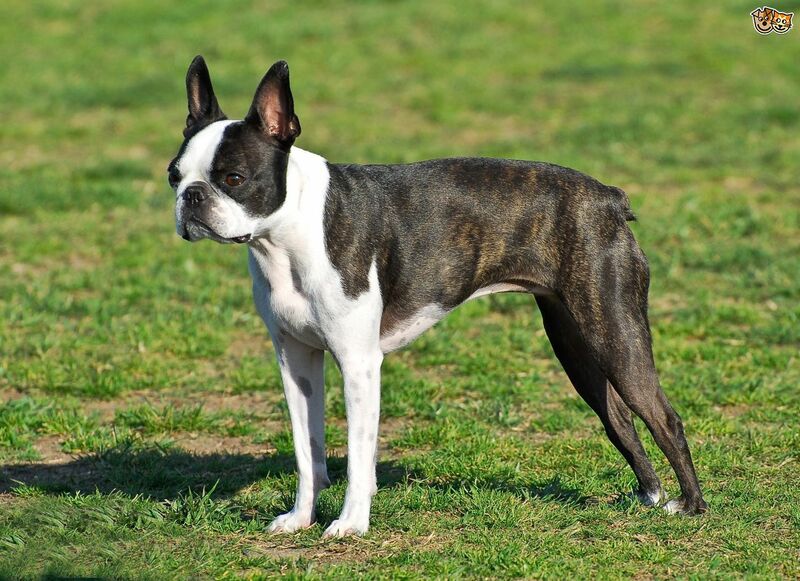 The shoulders are sloping and well laid back, which allows for the Boston Terrier's stylish movement. The elbows stand neither in nor out. The forelegs are set moderately wide apart and on a line with the upper tip of the shoulder blades. The forelegs are straight in bone with short, strong pasterns. The dewclaws may be removed. The feet are small, round and compact, turned neither in nor out, with well arched toes and short nails. Faults - Legs lacking in substance; splay feet. The thighs are strong and well muscled, bent at the stifles and set true. The hocks are short to the feet, turning neither in nor out, with a well defined hock joint. The feet are small and compact with short nails. Fault - Straight in stifle. The gait of the Boston Terrier is that of a sure-footed, straight gaited dog, forelegs and hind legs moving straight ahead in line with perfect rhythm, each step indicating grace and power. Gait Faults - There will be no rolling, paddling, or weaving, when gaited. Hackney gait. Serious Gait Faults - Any crossing movement, either front or rear. Brindle, seal, or black with white markings. Brindle is preferred only if all other qualities are equal. (Note: Seal Defined. Seal appears black except it has a red cast when viewed in the sun or bright light.) Disqualify - Solid black, solid brindle or solid seal without required white markings. Any color not described in the standard. Required Markings: White muzzle band, white blaze between the eyes, white forechest. Desired Markings: White muzzle band, even white blaze between the eyes and over the head, white collar, white forechest, white on part or whole of forelegs and hind legs below the hocks. (Note: A representative specimen should not be penalized for not possessing "Desired Markings.") A dog with a preponderance of white on the head or body must possess sufficient merit otherwise to counteract its deficiencies. Eyes blue in color or any trace of blue. Dudley nose. Docked tail. Solid black, solid brindle, or solid seal without required white markings. Any color not described in the standard. Click Here to Learn about breeder background checks on Boston Terrier breeders if you are looking for Boston Terrier puppies for sale. Click Here to learn how ResearchBreeder.com can help you find healthy Boston Terrier puppies for sale. Click Here to order a Breeder or Kennel Background Check on Boston Terrier Breeders that may have Boston Terrier puppies for sale. Click here to find the national breed club for Boston Terrier puppies for sale. Click Here to purchase a list of approved ResearchBreeder.com Boston Terrier Breeders who have Boston Terrier puppies for sale.